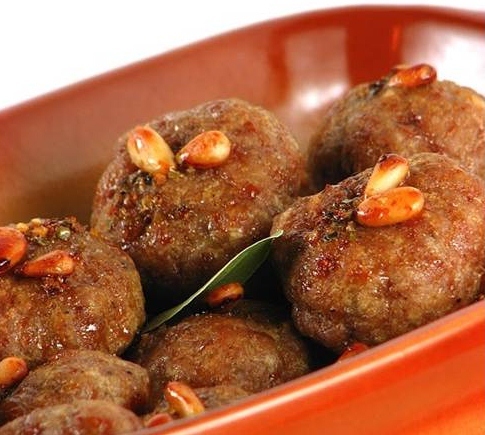 What the rest of Greece knows as keftedes or by the diminutive, keftedakia, Seven Islanders call polpetes, delicate little meatballs. In the Ionian area these days they are apt to be the mint-doused rendition common throughout all of Greece. This particular recipe, borrowed from Ninetta Laskari’s excellent book on Corfu, harks back to an older, more glorious time, when the Venetians ruled the palaces and palates of the Ionian Islands and taught local cooks to make these little meatballs stuffed with anchovies and hard-cooked eggs. 1. Place the ground beef, melted butter, egg, parsley, cheese, and salt in a medium bowl and knead until all the ingredients are mixed thoroughly. 2. In a small bowl, using a fork, crush the hardcooked eggs, anchovies, bacon, and curry to a pulp. 3. Remove the ground meat from the refrigerator. Take a heaping tablespoon at a time and shape into meatballs. Using your thumb, make an indentation in the center and fill with a little of the anchovyand- egg mixture. Press closed. Continue until all the meat and filling are used up. 4. 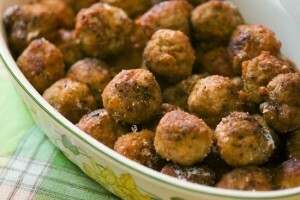 Spread ample flour onto a plate and dredge the meatballs in it, tapping off any excess. Meanwhile, heat about 1 inch of olive oil in a large, heavy skillet over medium-high heat until very hot, then brown the floured polpetes on all sides, in batches if necessary. Remove with a slotted spoon and drain on paper towels. Replenish the oil if necessary as you fry them, making sure always to bring it to a high heat before placing the polpetes in the skillet. 5. Strain the hot oil and pour about 1?2 cup of it back into the skillet. You can also use fresh oil if desired, especially if the oil left over after frying has acquired the harsh aroma of burned flour. Heat the oil over medium-high heat, then add the wine, tomatoes, and sugar to the skillet. As soon as it starts to boil, add the meatballs back to the pan, reduce the heat to low, and cook in the sauce for 10 minutes. Remove from the heat and serve, either hot or at room temperature with plenty of fresh bread. Set aside, covered, in the refrigerator for 1 hour.